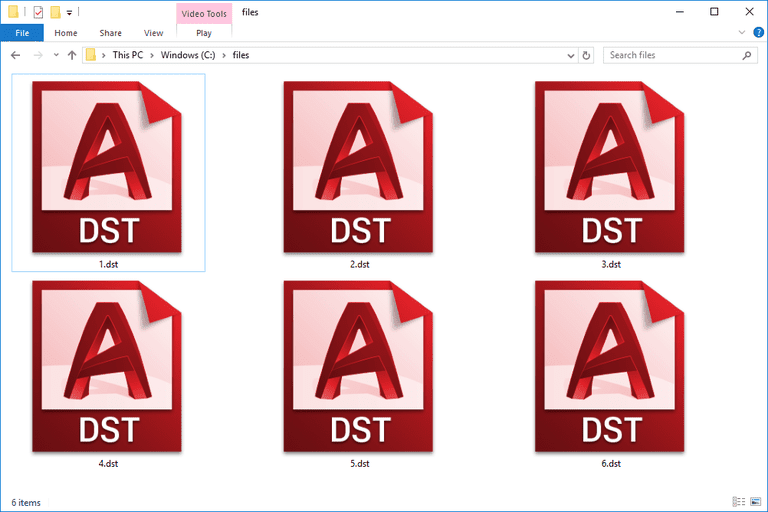 A file with the .DST file extension could be an AutoCAD Sheet Set file created by Autodesk's AutoCAD program to hold multiple drawing layouts. Tajima Embroidery Format is another file format that uses the DST file extension. The file stores stitching information that describes how the software should control the sewing needle. It's used by a variety of embroidery machines and programs. Other DST files might be DeSmuME Save State files associated with the Nintendo DS emulator called DeSmuME. These files are what's created when you save the game state within DeSmuME. AutoCAD's built-in Sheet Set Manager tool opens DST files that are Sheet Set files. The same tool is used to make DST files. You can display it via View > Palettes > Sheet Set Manager. Windows, macOS, and Linux users can open DST files that are DeSmuME State Files with the DeSmuME program. It can also create a DST file through File > Save State File. If you're dealing with data related to the embroidery format, a few DST file viewers you can get include Wilcom's TrueSizer, Embroidermodder, Embird's Studio, BuzzXplore (previously called Buzz Tools Plus), SewWhat-Pro, and StudioPlus. Wilcom also has a free online DST viewer called TrueSizer Web. Some similar Tajima file formats supported by TrueSizer and probably some of these other DST openers, include Tajima Barudan (.DSB) and Tajima ZSK (.DSZ). A simple text editor like Notepad++ can be used too, but it only shows some of the information in plain text, so it's only useful for reading the coordinates that the embroidery program pulls from the DST file. To open the DST file like an image so that you can simply see the design, use a DST converter from below. AutoCAD should be used to convert its DST files to any other format. It's unlikely that a third-party tool can do a better job than AutoCAD itself. Likewise, your best option for converting an embroidery related DST file is to use the same program that created it. That way, the original content that was used to build the instructions for the DST file, can also be used to export it to a new format (if the program supports it). If you don't have the original software that was used to make your specific DST file, at least try using the programs mentioned above that can open files in the Tajima Embroidery format. There might be an Export or Save As option that serves as a DST converter. For example, Wilcom TrueSizer is able to convert DST to PES if you need your file to be in the Deco/Brother/Babylock embroidery file format. TrueSizer Web can convert DST files too, to a large variety of file formats, including but not limited to, Janome, Elna, Kenmore, Viking, Husqvama, Pfaff, Poem, Singer EU, Compucon, and others. To convert DST to JPG or PDF so that you can see the pattern as an image, consider using a simple file conversion service like the free Convertio. Just upload your DST file to that website and choose a conversion format, and then download the converted file back to your computer. Convertio supports a wide variety of file formats, which means you can also convert your DST file to AI, EPS, SVG, DXF, and other formats. However, the quality or usefulness of a DST conversion with this tool might not be what you're after unless all you want is to view the DST file as an image. It's unlikely that DeSmuME State Files can be converted to a new format because the data is useful for games played within that specific emulator. However, it is possible that DeSmuME has an option for conversions/exports. The first thing you need to do if you can't open your file is to double-check that what you have is truly a file with the .DST file extension. AutoCAD uses some similar-sounded file types but they don't work in the exact same way as DST files, so that might be one reason you can't get your file open. Make sure you're not confusing it with a DWT (Drawing Template) or DWS (Drawing Standards) file. Another similar, but completely unrelated, example is the DownloadStudio Incomplete Download file format. These files use the DSTUDIO file extension which is spelled a bit like DST but not used with any of the software mentioned above. If you do in fact have a DST file, but it's not able to be viewed correctly, consider that you might be using the wrong program. For example, while embroidery files ending in .DST can most likely work with any other program that opens embroidery data, they can't be read correctly with DeSmuME or AutoCAD. In other words, you want to make sure that your file opens with the program that's intended to read, edit, or convert it. You can't mix these file formats simply because they share the same file extension letters.